Like the classic Sega Genesis games it pays homage too, Sonic Mania has unlockables galore. Some require you to complete specific challenges, while others can be unlocked with a cheat code. 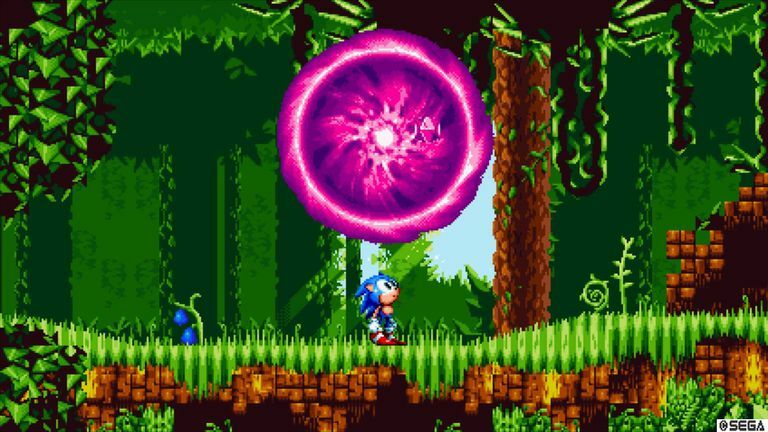 Learn how to get every chaos emerald, unlock Super Sonic, and see every ending in Sonic Mania. These Sonic Mania cheats work for all platforms, including PS4 and Xbox One. Cheats exclusive to Sonic Mania Plus are discussed at the end of the article. As you play through Mania mode, you'll gradually unlock new modes and options. For example, Time Attack and Competition mode become available immediately after you complete the first level of the game. Other cheats require you to collect medals from special Blue Sphere stages. You earn a medal every time you beat a Blue Sphere bonus stage. Depending on how fast you are, you'll get either a silver of gold medal, but you only need silver medals to unlock extras. There are 32 medals to collect in all. Fortunately, you don't have to acquire every medal in a single playthrough. The game will track your progress across all your save files. Debug Mode Collect 16 medals Play as a developer. Once unlocked, some of these extras can be accessed from the game options menu in Mania mode, while others appear under Extras in the main menu. In the Mania mode menu, highlight the save file you want, then press the game options button (as indicated in the upper-right corner of the screen) on your controller to bring up a menu where these features can be toggled on and off. Collect seven chaos emeralds in a single playthrough with any character. After you collect 50 rings in a stage, press the two jump buttons at the same time to transform. Blue Sphere stages: Collect 25 rings, touch a save post, and jump into the ring of stars to begin. Collect all the blue spheres while avoiding the red spheres to win a medal. UFO Chase stages: Jump through one of the giant rings hidden throughout each level. Collect blue orbs to increase your speed and catch the UFO within the time limit to save a chaos emerald. In debug mode, you can create signposts to access Blue Sphere stages anytime you choose. After beating the game, you can start at the beginning of any zone, but all versions of Sonic Mania come with a level select code that lets you pick the exact level you want to play. The process for unlocking it varies from platform to platform, but you will first need to enabled debug mode. From the Mania mode menu, highlight No Save. Press the game options button and enable Debug mode. Press the back button and select No Save to start a new game. Immediately hold down the following button as the screen goes black. Use the same button to cycle through the characters, then pick a stage. If you don't touch the controller when the game starts, you'll be treated to an animated sequence. After it ends, leave the game going without touching anything until the intro replays with an alternate song in the background. No matter which character you beat Dr. Robotnik with in Titanic Monarch Act 2, the ending will essentially be the same, but there are a few notable variations. To see Sonic Mania's true ending and fight the final boss, collect all seven chaos emeralds in a single save file, then complete the game as normal. After beating Dr. Robotnik, you'll have to battle a new enemy as Super Sonic (or Super Knuckles, or Super Tails). Depending on which character you play as, you'll see a slightly different ending animation. Beat the game in Knuckles & Knuckles mode to see a special ending animation. Sonic Mania was originally a digital exclusive, but Sega released a physical version of the game called Sonic Mania Plus featuring new content. If you've already paid for a digital copy of Sonic Mania, you can purchase the extra content as the Encore DLC pack at a discount. Sonic Mania Plus gives you two new playable characters: Mighty the Armadillo and Ray the Flying Squirrel. Each has their own unique abilities that encourage you to explore levels in new ways. Sonic Mania Plus also comes with new cutscenes, a pinball bonus stage, four-player competition mode, and Encore mode, which remixes the levels for a slightly different playthrough. In Encore mode, you can also switch between characters mid-level. On the level select screen, go to the sound test and play the tracks in the specified order to unlock the cheat you want. You should hear a chime if entered correctly. These cheats are exclusive to Sonic Mania Plus and the Encore DLC. This cheat requires a little more effort, but it's well worth it because you'll unlock everything in Sonic Mania. On the title screen, enter the following code between the time when Sonic appears and the "Press any button" text appears: Up, Up, Down, Down, Up, Up, Up, Up. You''ll hear a familiar tune if done correctly. When you return to the main menu, all extras will be unlocked.